Here we are going to learn a few words related to Amazon Fire TV. This is one of the streaming media players that lets you watch all the videos, listening to music, games, and other different apps through the internet. Usually, this comes in two models. One is fire TV box and another one is fire TV stick. In order to set up either model, you can plug into an HMDI port on your TV. Moreover, you will have a chance to use the included remote to follow all the on-screen instructions, Connet to your internet, and select the respective app which you really like to go with it. I hope you got some idea relate to it. Am I right? And let me tell you the difference between box and the stick models. As such you can have a look before you go buy for it. Fire TV supports 4k ultra HD and HDR video. Both of these models support 1080p HD resolution. Make a note as the box is a bit faster, has more memory and supports high-quality audio compared to stick model. As this has numerous apps relate to videos, music, games can go for your favourite irrespective of time. Till now we have seen what exactly it is. And now we focus on all the cool features that give you some idea to go for it and use successfully. So are you ready to learn them? Here we go. 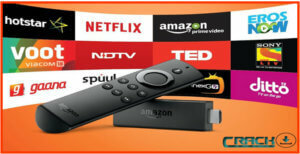 Prime content: Usually, Amazon says Fire TV stick offers a lot of movies, TV episodes, sports, news, music, games and much more. Also, the Hollywood blockbusters very well. This can be connected to prime, hotstar, youtube, gaana and so on. Ease of use: Usually, it comes from the pre-registration process as the user need not to face any trouble with registering and use well. All the thing they have to connect to along with WiFi without any fail. Voice search remote: Well, while you think about it, this is the unique part of Amazon Fire TV Stick. Responds instantly and allows the user to search for Amazon video content using their respective voice. Track data usage: This is one more option where you can keep an eye on its respective data surfed through Fire TV stick. Through data monitoring feature, the user can select the respective viewing quality in order to manage data use. Also, can configure their fire TV stick to alert when it extends the preset limit. Here we go with all its process in step by step. So have a look, follow them and start working on your Amazon fire right now. So are you ready? If yes, here we go. First and foremost, you need to have an Amazon account registered with the respective device. Well, if you do not have an account also not an issue. There you will see an option to create when you are going through the setup process. Now connect the power adapter to the respective Firestick. Plug the other end of fire stick to HDMI port available on your TV. Switch on to your TV and choose HDMI input channel for the particular port you used to connect the Fire TV stick. And finally, you will notice loading screen with the respective fire TV stick logo. Load the suitable batteries in your remote and pair it with the respective Fire TV. Follow all the on-screen instructions to connect your device to the internet through wifi. I hope you are now aware of Amazon fire cool features and it’s usage. Therefore, if you have any doubts, simply drop a comment on the below section. Also, like the article, share with friends and also on social networking sites with no second thought. For any doubts, drop a comment on the below section. Thank you. Stay back to CrackO CrackO for more interesting stuff.